Breffni Air has been granted PLANNING permission for two new factory units on the edge of Cavan town, close to the company Head Office in Ireland. The new units, which measure 4,850 meters squared each, will house administration, manufacturing, warehousing and other offices. This significant expansion marks the second business development undertaken by the Mechanical Engineering firm in the last 2 years. 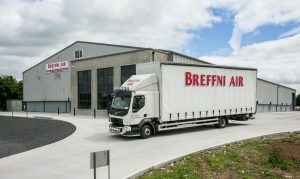 Investment into new product development and strong customer loyalty has ensured Breffni Air Ireland Ltd has kept well ahead of the competition.